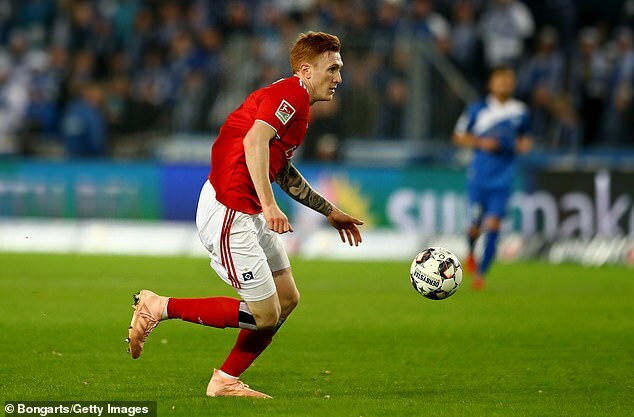 For David Bates, leaving Rangers was never a question of money. Moving to Hamburg was a quest for personal growth. Both as a football player and as a man. ‘I could have stayed in Scotland, I could have gone to England. But you don’t often get the chance to join a club the size of Hamburg. People back home don’t realise how big this club is. Leaving Glasgow for a team relegated to Bundesliga 2 raised eyebrows but Bates is dismissive of accusations he ever held Rangers to ransom over a new contract. Indeed, even while growing up in the Fife coastal village of Limekilns he harboured a vague notion of playing abroad one day. Spotted by Hamburg sporting director Johannes Spors while he was casting an eye over Moussa Dembele in a 0-0 draw with Celtic at Parkhead last December, the opportunity was one Bates couldn’t turn down. Now, he learns German three times a week, walks the streets of Hamburg unhindered and, courtesy of a daily direct budget flight to Edinburgh, sees more of his family and friends than he did when he played for Rangers. ‘When that stuff came out in the papers about leaving Rangers I couldn’t believe what I was reading,’ he says. ‘I just wanted to come here to develop and improve as a footballer – it wasn’t a question of money. I spoke to other clubs in England and I could have made more money there. But I wanted to be a better player and I am already 100 per cent a better player than I was. ‘People used to say my passing was weak and I was not great on the ball. Well, I am better on the ball now. We are always on the ball here. I learned stuff under the former coach Christian Titz they don’t even think of in Scotland. 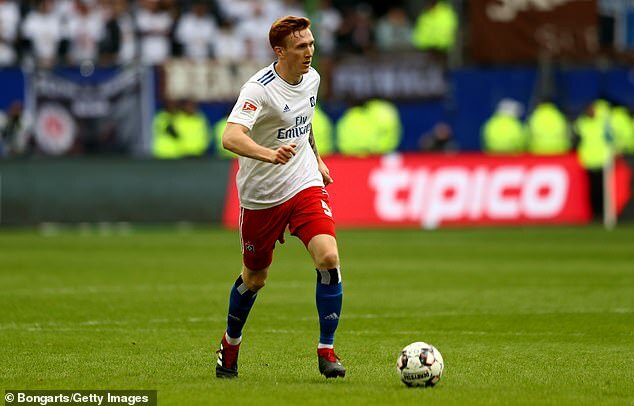 The road to personal growth didn’t always go smoothly for the man affectionately known as the ‘Ginger Ramos’, a nickname that has followed him to Germany from Ibrox. Bates used to travel across the Forth Bridge to play for Hearts as a free-scoring striker until his 13th birthday brought puberty crashing through the door. ‘I went through a growth spurt and I lost everything,’ he says. ‘I lost my pace, I lost my striking ability. I became a bit self conscious maybe. After a trial with Cowdenbeath, he signed for Raith Rovers at the age of 17. It was there he become football’s accidental central defender. ‘After a few games they didn’t have a centre-back one day and they asked me if I would play there,’ he recalls. There was a loan spell at East Stirling. A few months at Brechin City under mentor Ray McKinnon. Long before the 57,000-seater Volksparkstadion became an impressive new home, Bates had played in every senior ground in Scottish football. It offered an appreciation for the life he has now. ‘At Raith, I would go to the stadium as a young boy and pack a van with the bibs, balls and cones and travel up to the Michael Woods Sports Centre in Glenrothes to meet the first-team players,’ he says. ‘It was a community sports centre. You would go to the gym and you’d be there with grannies and everyone else from miles around. I had four pairs of boots to clean every day. We would sweep the floors, clean the changing rooms. I even washed the dishes. ‘Then I went to Rangers a couple of years ago and suddenly it was right in front of me. I would go to the gym and there was nobody in it. And I didn’t have to pay. You had boot boys, cleaners, you name it. ‘That (time before Ranger) was no bad thing – because I appreciate what I have now. I saw how good it was at Rangers. I see how good it is at Hamburg. We used to train on astroturf every day and when you come here the pitches are like carpets. A desire to make the absolute most of his talent was drummed into him by dad David. A former coach at Inverkeithing United, he remains his son’s toughest critic. ‘I would get back from school at the age of 13 or 14 and dad would jump straight on his bike and say to me, “Come on, out for a run, keep yourself fit”. Bates arrived at Rangers in 2016 determined to wring every last drop from the opportunity. If he failed, it wouldn’t be down to a lack of effort. ‘I was always in the gym and I could see boys saying, “Ach, not today. Don’t fancy it”. ‘Maybe there were times I was in there too much. But then I would see players not doing enough because they didn’t appreciate what it is they had. ‘They’re not lazy, they don’t lack commitment. Maybe they are just better footballers than me. Maybe they are more natural athletes. The desire to improve and perform at a higher level persuaded him to try his luck in Germany. Despite 20 appearances for Rangers last season, Ibrox director of football Mark Allen was blunt in his admission the club would be signing new defenders. Asked if he ever felt Rangers *really* wanted to keep him, he says: ‘If I’m being honest? No. If they had really wanted me, they would have done it. ‘But these things happen and sometimes they happen for a reason. ‘My contract was up and we decided to see what was out there. ‘When I heard about Hamburg, I thought, “Wow, what a chance this could be”. ‘I went to the Volksparkstadion to sign and was blown away by the place. Yet, his new life in German football got off to a bad start. Relegated for the first time in their history, Hamburg then marked their first game in Bundesliga 2 with a 3-0 home defeat to Holstein Kiel. Bates was substituted after 57 minutes. Three months later, he has ten appearances to his name and eight clean sheets. A youthful partnership with Dutch Under-21 international Rick van Drongelen is taking shape, meanwhile, and his high school German is improving via lessons. ‘It’s important to speak the language,’ he says. ‘When the manager speaks, I have to be able to pick out phrases and understand what he is saying. Recent reports in England claimed Arsenal and Everton have been to watch him in action and that’s more than can be said of the SFA. Yet to move beyond the Under-21 team, he uses international call-ups to stock up on bottles of his beloved HP Sauce (‘it’s the only thing I miss’). Life in Germany is good. When he went in search of personal growth, Hamburg proved generous teachers. ‘The city is beautiful, my girlfriend is out here with me and there are no shortage of nice restaurants,’ Bates enthuses.